PRODUCT: Sievert # 3334 Replacement 38MM Flameless 6100 BTU / 1200F Hot-Air Burner. Price/Each. APPLICATION: Hot-air burner with powerful windproof hot-air streams for heating PVC or other membranes where an open flame not is suitable. Commonly used for Single Ply. 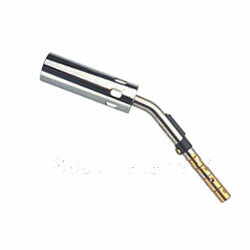 Fits PNS-4 Torch and Promatic Torches / Welders. Sievert # 3344 Medium Standard Flame Burner. Provides up to 12 inch flame with 25,500 BTU Output. Head is 1 Inch OD x 8.5 Long, 5.9 Oz. Fits Sievert Promatic Torch (#3366-97), not included. Price/Each.